We have shown to capitalists how we can reproduce a conflict globally when they repress and fire us because of exercising our labour rights, breaking the isolation and the lack of communication between the exploited people worldwide. This was only the beginning, and we will fight until the only possible end to this conflict: the reinstatement of the comrade and the restoration of his union activity. From our union assembly, we want to express to all our comerades around the world the biggest sense of brotherhood and the infinite gratitude from the dephts of ourselves. THANKS. 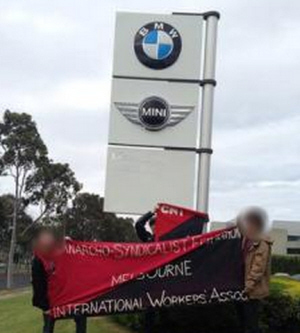 IMMEDIATE REINSTATEMENT TW-BMW FIRED DELEGATE! !